Wool pillows offer something for everyone, with customizable firmness, natural flame and pest-resistant properties, and an incredible ability to be insulative and breathable at the same time. Encased in our durable organic cotton twill, our wool pillows can be fluffed, refilled, and reused for years to come. 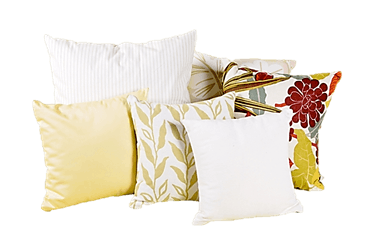 Available in a variety of shapes and sizes, these pillows are perfect for accenting couches and guest beds. Not sure how firm you like your pillows? Get your pillow with a zippered case and add or remove filling to suit your own preferences. Simply store any excess material in a moisture and pest-proof container, or order more wool from our Wholesale Fibers section. When your pillows are ready for a fluffing, simply unzip, empty, and restuff. is this a pillow insert? or is it decorative? If decorative, which color/pattern is it? This is a Wool Pillow Insert only. Decorative Pillow Covers can be found under Bedding.